Day 20 at thye BBA Upville house, and Zainab, Maneta, Mampi and Barbz got into a deep conversation, mostly centered around pregnancies, natural birth, and things that generally make men queasy. Of all the girls in the house, Zainab is the only one that is a mother so she definitely took the lead on the conversation. Maneta also spoke about experiencing tragedy at a very young age when she lost her parents. Barbz seems to have had a pretty happy life, and so was mum through much of the chatter. Also Malonza and Keagan had a discussion about the Downville girls; they both claimed that none of the girls have “made their heart to skip a beat” and that none of them is their “type”, contrary to what we see between them, that they are just “”joke buddies”. A poll was conducted in the house: The housemates were voting for the “housemate with the most swag”, and Zainab led the polls but not by a wide margin. The runner-ups were (in order of the highest votes): Seydou, Barbz, Keitta, and Eve. Edith complained about her need for cigarettes, she insisted that they made her sane, and that she relaxed by (filling her lungs with cancerous smoke) having a ciggie. They also give you lung cancer, darling, so give them up. All of you! In the evening, the couple made-up, giggling, and the usual. Could it have something to do with Goldie’s new position as Head of House? After dinner, the two clearly couldn’t escape the jolly mood in Upville. They sang along with their fellow Starmates, with Goldie busting a couple of moves on the lounge floor. Lady Gaga on a budget repping Naija! 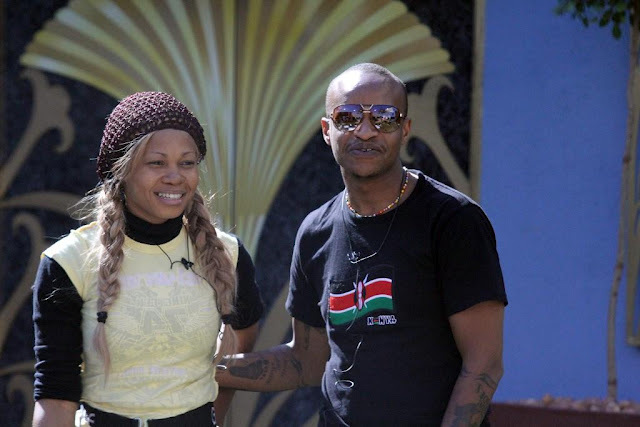 Hmmm, seems things might start getting intense as they(goldie and prezzo) bring the heat.